Crepes aren’t just for fancy French bistros. 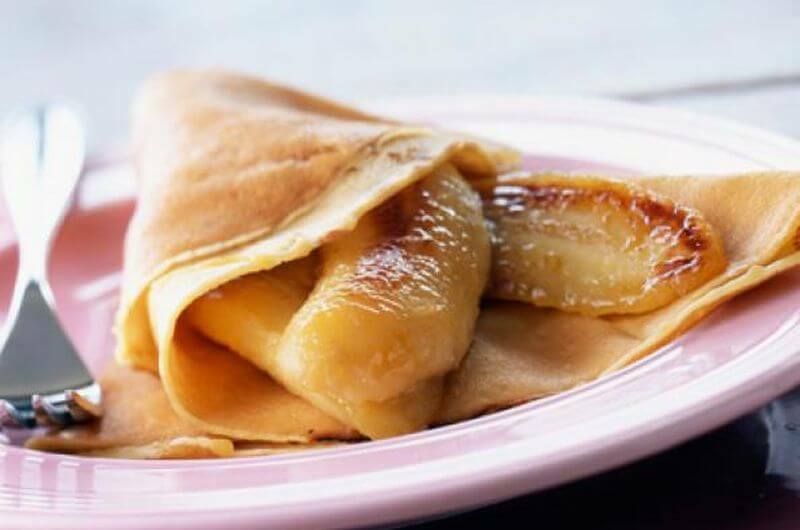 Whether you like them sweet or savory, you can enjoy delicious crepes at home with these easy recipes. Crepes are not just a dessert food. You don’t have to be a gourmet chef (or French) to enjoy stellar crepes at home. If you thought crepes were only for decadent breakfasts or sugary desserts, then it’s high time you checked out these recipes. From mushroom ragout to kale, lentils, spinach, zucchini, ricotta, and avocado, you’ll find savory ingredients (and way less sugar) in many of these dishes. If you’re looking for the sweet stuff, don’t worry. I’ve got you covered. 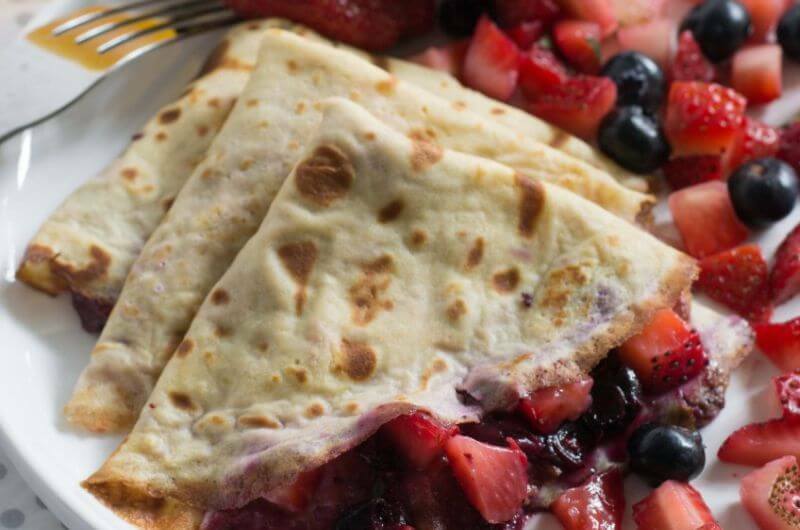 Check out the eggless chocolate crepes, cinnamon crepes with peanut butter cream filling, strawberries & cream crepe cake, or berrylicious whole-wheat crepes with Greek yogurt. Whether you prefer savory options or crepes on the sweeter side, you’ll be able to make these easy crepe recipes at home—even if you’ve never taken a cooking class. One more great thing about these crepes? Many of them are high in protein. And if you’re trying to lose fat or gain muscle (or both), then eating a high-protein diet is key. As these recipes prove, watching your macros can be both easy and delicious. This simple crepe recipe is from Alton Brown, known for the Food Network show Good Eats, where he not only tests recipes but delves deep into how they work. That way you know what’s crucial to nailing each step, as well as what can be changed to cater to your taste buds. 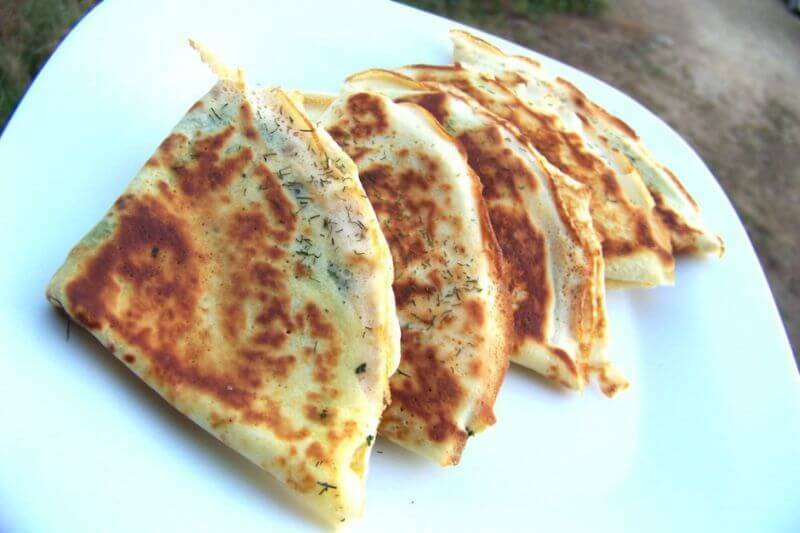 In the case of crepes, that means starting with the basic ingredients and then adding extra flavors, like fresh herbs for a savory version versus vanilla extract to make them sweet. Food geeks will love Alton’s cookbooks because they’re packed with as much know-how as his TV show. 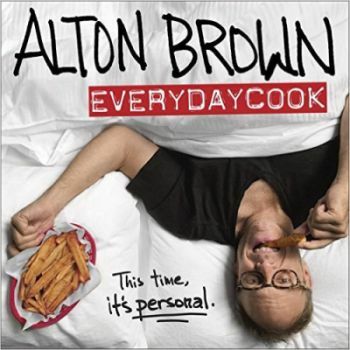 Stay tuned for his latest recipe collection, Alton Brown: EveryDayCook, out September 2016. Crepes can be a quick meal: Stir together the batter, cook for a few minutes in a hot pan, and then roll up with fresh fruit in the middle. Add a dollop of Greek yogurt, and you have a complete breakfast. But when you have extra time to make an indulgent brunch, remember these savory crepes with baked eggs and sautéed mushrooms. Prepare your favorite crepes, and let them cool while making the mushroom ragout, which cooks in a skillet for about a half hour. That’s just the start. 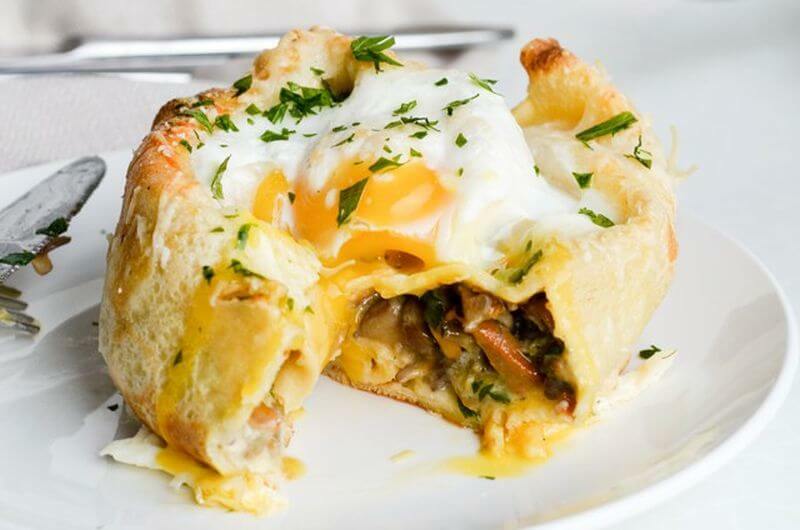 Fill the crepes with the mushrooms and cheese, arrange them in a baking dish, and that’s when the eggs get baked on top. The result is a plate of mouth-watering crepes like you’ve never seen or tasted them before. Chocolate crepes seem fancy, but there’s hardly anything to making them. 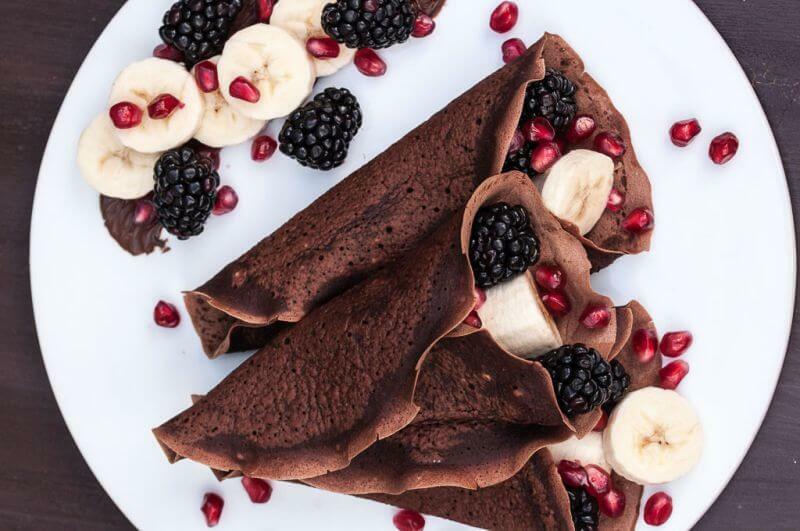 Just a bit of flour, cocoa powder, and maple syrup can be turned into vegan crepes that are super thin but packed with flavor. And they’ll keep well in the fridge or freezer for a quick chocolate fix – and an excuse to eat more fresh fruit. If you need to practice making crepes, there’s no better dessert to try than a cake like this. 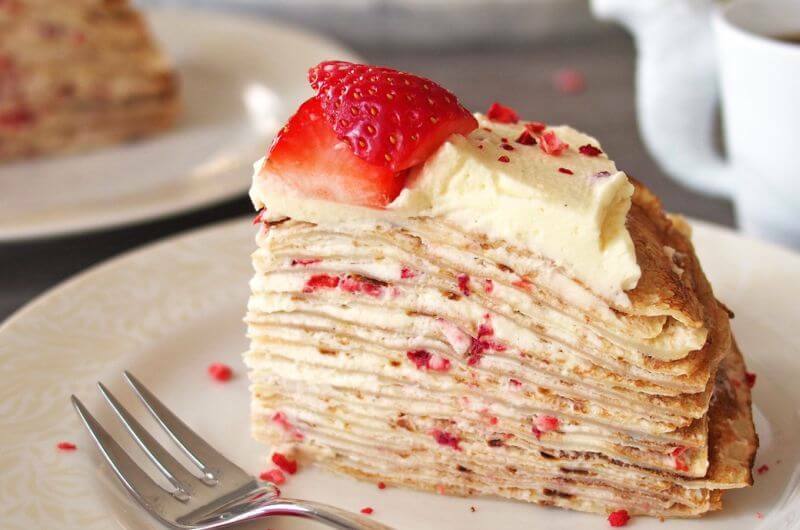 Called milles crepes in French, aka 1000 crepes, this beautiful dessert is made by stacking them with a layer of cream in between. But don’t get hung up on the name – you need just 20 crepes to assemble the whole thing. To make the traditional dessert crepes, you need just pantry staples: flour, milk, oil, and eggs. If you prefer to use coconut oil or butter, just be sure to bring the milk to room temp before mixing it in. That way it won’t cause the fat to become solid and mess up the silky crepes. Since coconut is a fairly heavy fruit, it might not seem like it could make light, delicate crepes. But these have everything you’d want in a thin crepe plus lots of coconut flavor. Since it uses coconut flour, coconut oil, and coconut milk, it couldn’t possibly pack in more of the tropical fruit. 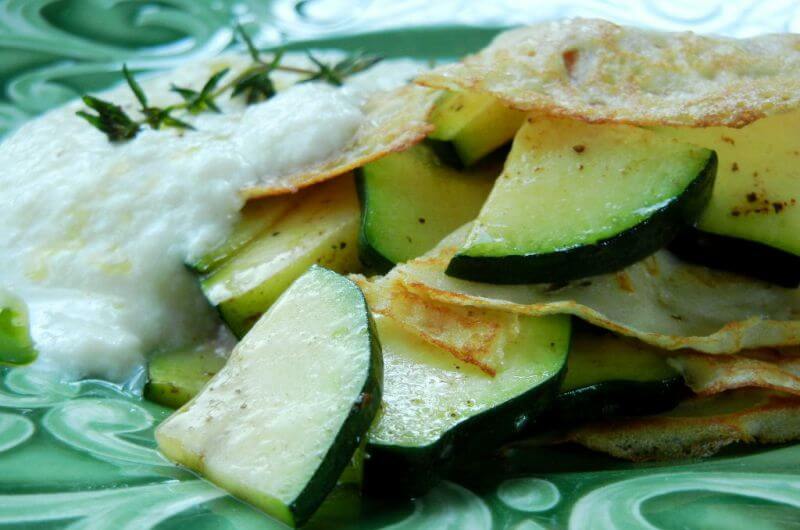 That combo of rich ingredients makes very low-carb crepes with less than 5 grams per serving. Instead of starch, they’re full of healthy fats and protein to keep you full whether you’re having breakfast or a late-night snack. These crepes look like dessert and taste like pie, but they have a secret. Both the inside and the outside are hiding vanilla protein powder. When you’re adding that much protein to a recipe, integrate a little at a time. 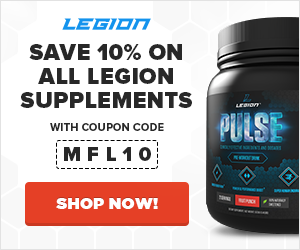 Since each brand has a different mix of whey, casein, and other kinds of protein, always combine the ingredients slowly to see how much liquid the protein powder will absorb. For a crepe batter, look for the consistency of a thin cream, so think slightly thicker than milk but nowhere near cake batter. Not all crepes are French. 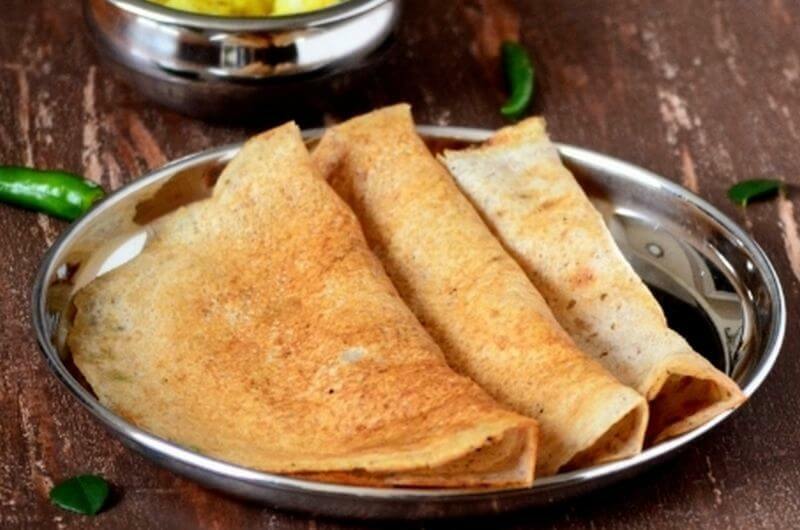 In India, crepes can be made from a variety of flours, including rice and wheat. Or, like this traditional version, they can be made with lentil flour. The process starts with soaking and grinding split yellow mung beans, aka moong dal, to make the base. The homemade flour is mixed with yogurt, spinach, onion, and lots of spices to make the batter. 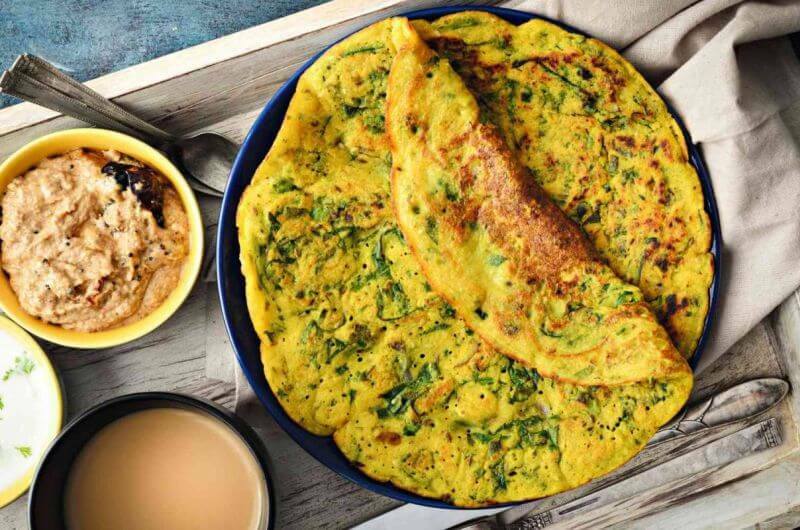 The result, called dosa, is flavorful as is, or can be served with coconut chutney, pickled veggies, or tomato jam. 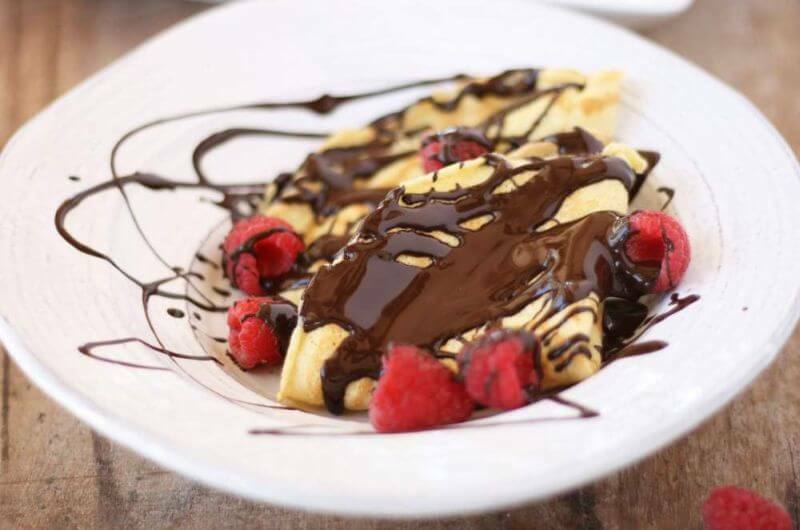 Crepes might make you think of fresh fruit, chocolate sauce, and powdered sugar. Yet without the filling, they’re little more than a wrap. 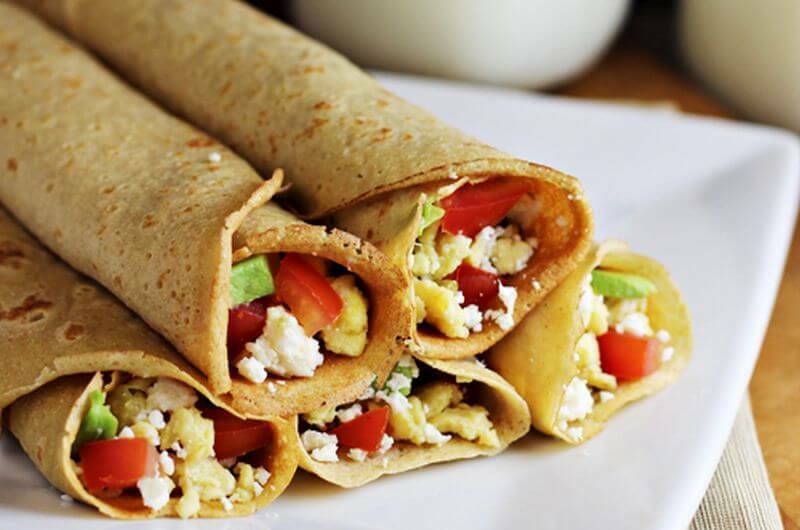 And that’s good news because crepes can replace tortillas to upgrade your breakfast burrito. 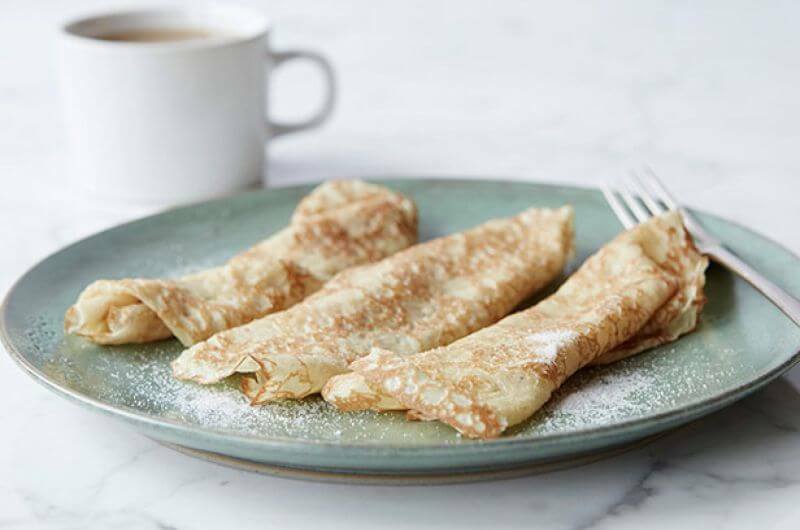 Start by making savory crepes – in other words, leave the sugar and vanilla extract out of the batter. Then fill with scrambled eggs and any other ingredients you like, such as cheese, beans, avocado, and pico de gallo. Whole-wheat flour is a lot less processed than white flour, which is why it provides complex carbs that digest slowly and won’t send blood sugar levels soaring. To get those nutritional benefits in a fine-grain flour that’ll ensure your crepes are smooth and soft, use a variety like white whole-wheat. Also called whole-wheat pastry flour, it’s made from a variety of wheat that’s softer and naturally lighter in color but delivers the same nutritional benefits. 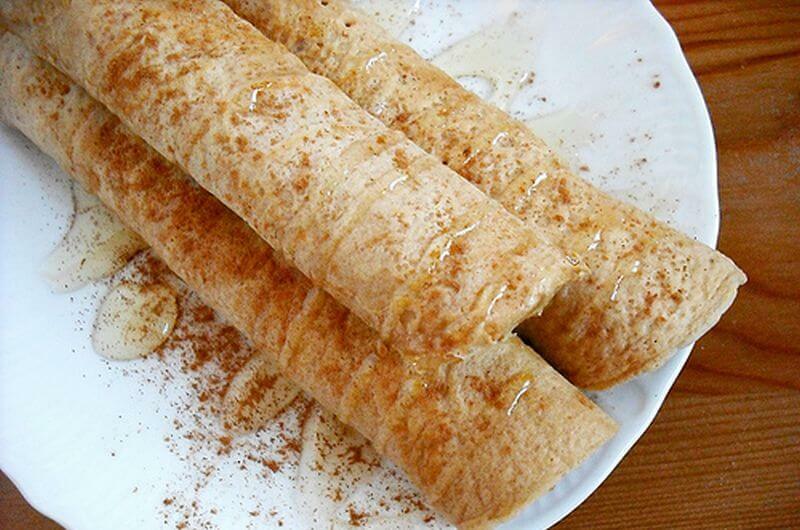 If you already love banana protein pancakes, simply change the ratio of those same ingredients to make crepes. Since the batter has to be much thinner, you’ll need more eggs to add liquid. And depending on the amount of protein powder in the batter, mixing in a little water or milk can ensure the crepes can spread out to be thin. After you make the first crepe, you can always assess the thickness and stir in more liquid as needed. 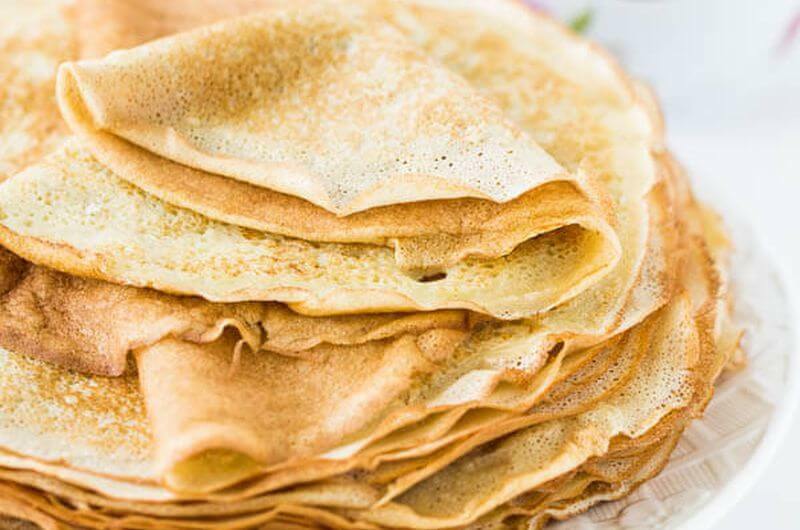 Rice flour works well in crepes because it’s soft and can make a thin batter. 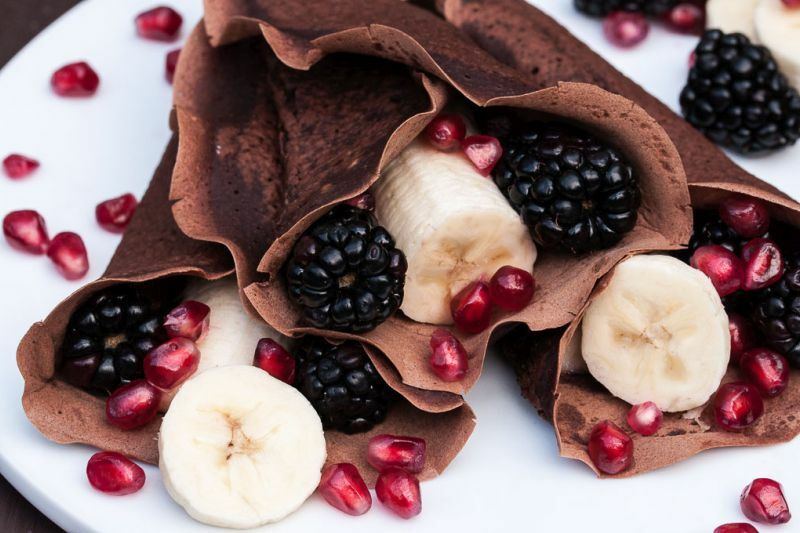 This recipe uses a little of everything to offer a variety of nutrition without affecting the texture, so no one will even know these crepes are made from a healthy recipe. To get picture-worthy crepes that are browned and not burnt, only lightly grease the pan. Either brush on just enough softened butter to coat the skillet, or use a paper towel to wipe it down with a thin layer of oil. The beauty of crepes isn’t just how thin they are, but that the emphasis is on the filling. This one is rich in terms of flavor and protein with a mix of combo and peanut flour, better known as PB2. The crepes themselves are barely there. Lacy and thin, using ground flaxseed to hold them together rather than flour. With a combo of flax and egg whites, they’re mostly protein. 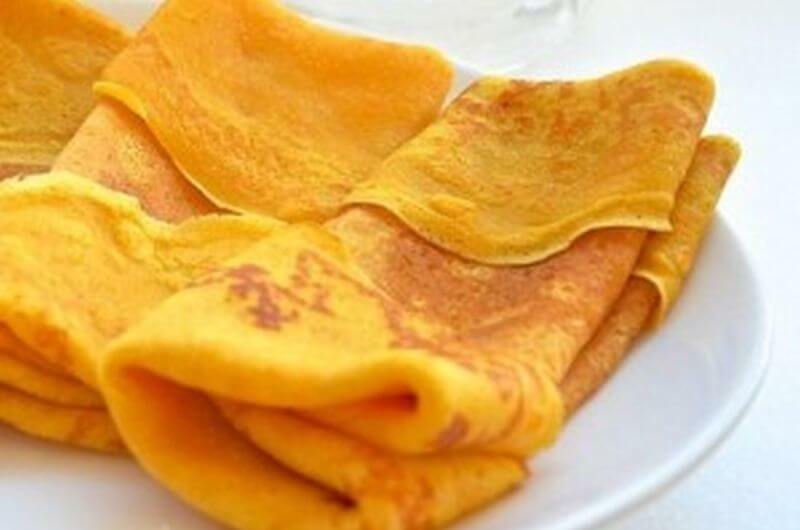 These low-carb crepes contribute only 7 grams to the entire recipe. Crepes don’t have to be flavorless. Add cottage cheese, and they’ll not only be fluffy but will make every filling or topping you choose taste richer. Serve cottage cheese crepes with fresh strawberries, and you have strawberry cheesecake. Or, a peanut butter sauce will add protein. Enjoy big flavor without eating extra fat by mixing PB2 with milk or almond milk until it’s thin enough to drizzle over the top. When you imagine French crepes served in a bistro, this breakfast plate is what comes to mind. They’re almost paper thin, lightly browned, and perfectly lacy. To make crepes super thin, be sure to use a large non-stick skillet (unless you have an actual crepe pan). A frying pan that’s 10 inches in diameter at the top doesn’t have as wide of a surface area at the bottom. If you don’t have one that big, be sure to use less batter – just enough so it can spread out to cover the pan. Think crepes can’t rival a stack of pancakes for an incredible breakfast? Check out this savory cake with layers of smoked salmon, fresh spinach, mayo, and veggies. 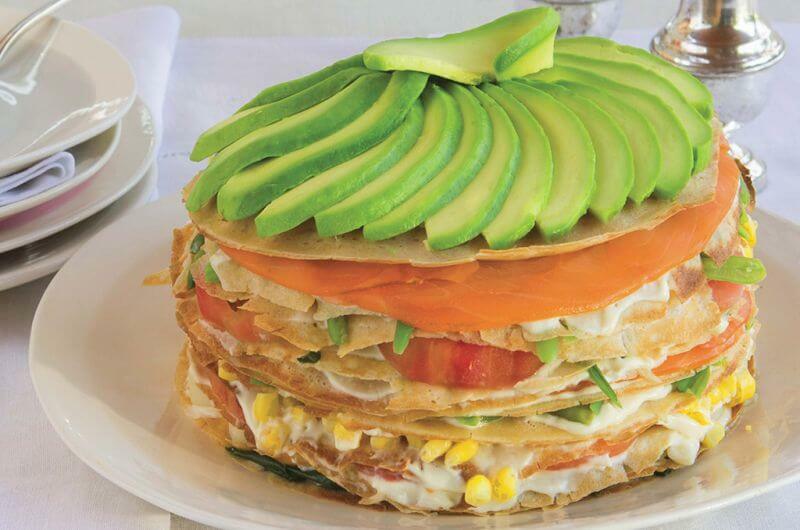 It’s topped with an enticing spiral of avocado slices for an easy yet impressive presentation. To make them look like frosting, just mash those avocados up, and spread over the final crepe. Garnish with fresh chopped herbs, like cilantro, if desired. 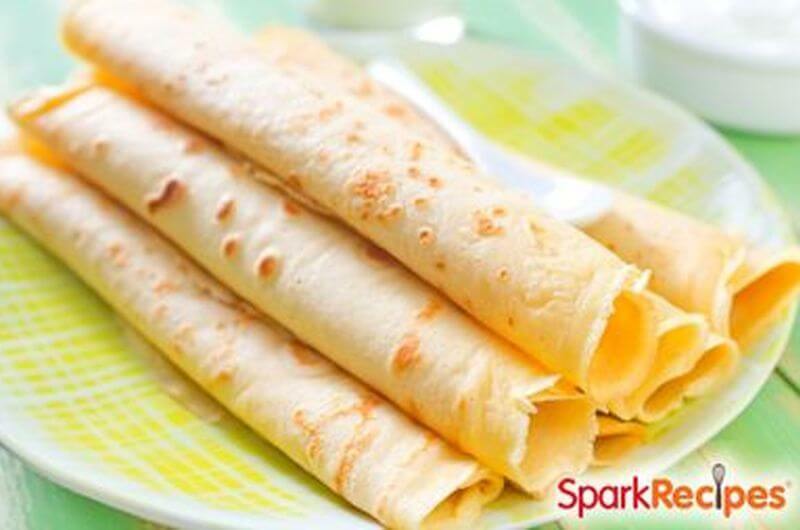 For gluten-free crepes, try this Indian variety made from a mix of flours, such as finely ground rice. This recipe uses buckwheat too for its rich flavor and excellent nutrition. It contains more fiber than oatmeal, plus more plant-based protein than lentils. And these crepes couldn’t be easier to make. Just measure out the two kinds of flour, and stir in water until the batter reaches a good consistency. Add ground flaxseed if you want the omega-3 fatty acids, or leave them out to reduce the calories per serving. Serve with chutney or potato curry. This blender batter is made of healthy baking ingredients like whole oats, applesauce, and egg whites. 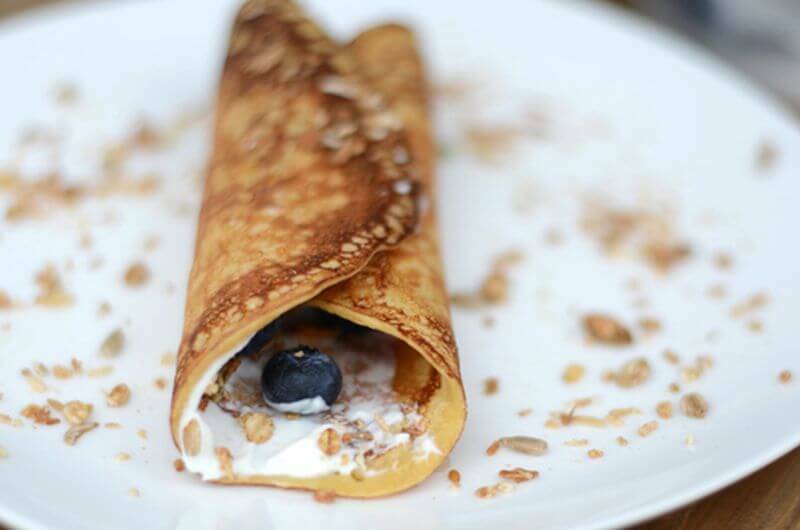 Yet you won’t end up with pancakes or muffins, but protein-packed crepes. That’s because there’s almost as much protein powder as there is oatmeal in this recipe, as well as enough milk to make thin, light crepes. With macros like this, these crepes are a great breakfast before a morning workout. They’re light and fluffy, so they won’t weigh you down. And best of all, they taste like a sugar cookie. 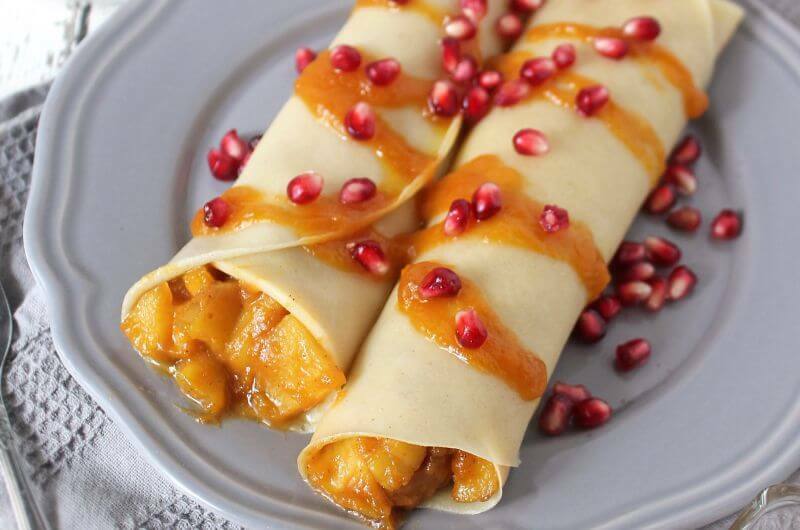 Satisfy pumpkin cravings year-round with these simple crepes. Depending on the filling you choose, they’ll make a healthy breakfast or a satisfying dessert. The way these cheesy crepes are filled and folded, they’re like a healthy breakfast wrap or portable snack. Inside is a delicious combo of kale, fresh dill, and melted mozzarella, but any mix of fresh greens and cheese will do. These grilled cheese crepes are great when they’re fresh out of the pan, yet they’re also delicious enough to eat cold. So if you wind up with leftovers, keep them in the fridge until you need a grab-and-go meal. Make your own ricotta, and you’ll wind up with a bonus ingredient to save for something else: liquid whey. That’s what’s remaining after the milk turns into curds for cheese – resulting in about two cups of ricotta in this case, which is more than you’ll need for the crepe filling. While many simply toss it once the cheese-making process is done, that liquid contains the same kind of protein found in whey powder – much less of it, but more overall nutrients like calcium and other minerals to make it worth saving. Not only is it good for you; liquid whey is great to use in something like crepe batter or whenever you want an airy texture, like in breads or pastries. What do you think of these easy crepe recipes? Have anything else to share? Let me know in the comments below!